After this article was included in my newsletter, we got two very helpful comments–from opposite sides of the track. “I just had to put in my 2 cents on the Vitamix. I love mine! It isn’t a juicer, but rather is a great smoothie-maker: You can throw in fibrous fruits and vegetables (like pineapple cores, kale, swiss chard, etc.) and the jet-engine motor pulverizes it, making a yummy smoothie without little chunks or pieces. Also, it is much easier to clean than a blender. You don’t take it apart at all. Just put water and a little dish soap in, turn it on and it cleans itself (of course you need to rinse out the soapy water, but that’s it. You don’t even need to put hot water in, the water heats by itself as it is cleaning the blender…revolutionary. In fact, you can throw veggies and broth in and make a soup that heats itself up and cooks right in the blender. I think Vitamix should give me a commission. It was worth every dime!! The two things I quickly discovered about the Vitamix were it takes up a lot of room, plus I don’t want to drink my diet on a regular basis. I enjoy the zen of food prep and the smell of cooking food on the stove. But the bottom line for me is I like to masticate my meals, keep the choppers exercised and the saliva flowing. The Nutribullet can do anything the Vitamix can do and more, just in small batches. There are 2 blade attachments, the first for maceration and extraction, the other for making flour. 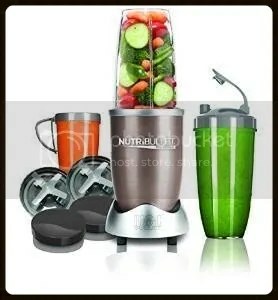 I’ve thought about a food processor, but for the most part my Nutribullet will do what I can’t do by hand.